Compilation with remixes from Björk's 1st full-length studio album Debut. At the time of release all the tracks were already available on singles and 10" promos, except "Come To Me (Sabres Of Paradise)", which remains exclusive to this release. My copy has a "MADE IN GERMANY" sticker on rear instead of "Australia"
This is a small but great collection of mixes from DEBUT, i really enjoy the One Day mixes. they are awesome!! 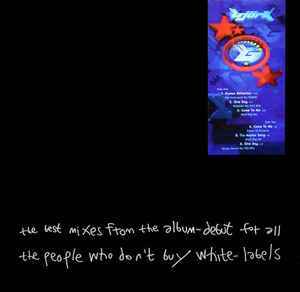 This EP 'The Best Mixes From Debut (For All The People Who Don't Buy White Labels)' is the only one to feature the version.